I have to apologize, I’ve had so much on the go these past months that not only has it been difficult to get a new post up about our Dogo Argentino it’s been difficult to get her out for a walk. She’s definitely feeling it. Not ten minutes into our almost hour long walk she was panting and ready to turn around. She made it, though, and so did we. There wasn’t a bug in the air, the sun was warm enough to tempt us in having a Corona but the wind blew lightly enough to keep us enjoying the day. It’s days like this day I love the most. With family, immediate and extended, sun and a breeze and the afternoon to enjoy it all. Hopefully while I’m off this summer I can get our Dogo out more and now that things have maintained some sort of normalcy I can get back to blogging here. 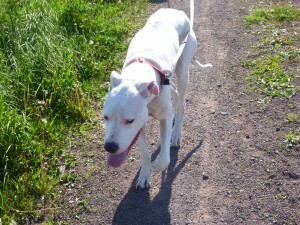 This entry was posted in Uncategorized and tagged Corona, Dogo Argentino, Normalcy, Sun on June 2, 2010 by CoronaTheDogo.